Tensions rise as Taipei protests Beijing’s new national security law in the run-up to Taiwan’s 2016 election. On July 1, 2015 the National People’s Congress of China (NPC) approved a new national security law (NSL), which covers a wide range of issues, among them territorial sovereignty and security of seas and airspace or cyber security. The law was adopted unanimously with 154 votes in favor and only one abstention. For the first time, the document included Hong Kong and Macau in its scope. Moreover, the new NSL stipulates that “compatriots from Taiwan” (along with all the Chinese people from the mainland, Hong Kong, and Macau) have the obligation to safeguard the territorial integrity and sovereignty of China. The Mainland Affairs Council (MAC), which is responsible for Taiwan’s relations with China on a ministerial level, issued a protest note on the same day. The “solemn statement” describes the adoption of the NSL as an action harmful for cross-strait relations and the status quo in the Taiwan Strait. MAC also underlined that China’s unilateral actions would not change the fact that the Republic of China (Taiwan) is a “sovereign state”, separate from the mainland. MAC also pointed out that the content of the NSL was disrespectful to Taiwan and its people. MAC also reiterated Taiwan’s adherence to the status quo based on the principles of “no unification, no independence, and no use of force,” which it regards to be the mainstream opinion among the Taiwanese. Finally, it called on the Chinese side to take into consideration the improvement in cross-strait relations in the past seven years, as well as Taiwan’s public opinion on the matter. Although cross-strait relations certainly have improved under President Ma Ying-jeou’s administration, there have been tensions recently between Taipei and Beijing. In early June, the Taiwanese Minister of Foreign Affairs, David Lin, criticized the Chinese ambassador to the U.S. Lin called Cui Tiankai’s remark – that one of Taiwan’s presidential candidates should meet the approval of China’s people – inappropriate. Beijing’s top diplomat in Washington also referred to the Democratic Progressive Party’s (DPP) presidential frontrunner Tsai Ing-wen’s recent visit to the U.S. as to a “job interview.” Unfortunately, in its attempts to twist Taiwan’s arm, Beijing goes beyond undiplomatic statements. During Tsai’s stay in the United States, China conducted military exercises in the Bashi Channel, south of Taiwan. According to Jane’s Defense, the drill was a practice invasion of Taiwan. Beijing’s recent provocative behavior vis-à-vis its tiny neighbor resembles the so-called Third Taiwan Strait Crisis, albeit significantly smaller in scope. In early 1996, China fired a set of missiles into the Taiwan Strait to intimidate the Taiwanese voters in the run-up to the 1996 presidential election. However, the Taiwanese electorate called Beijing’s bluff and handed the pro-independence Lee Tung-hui a landslide victory. 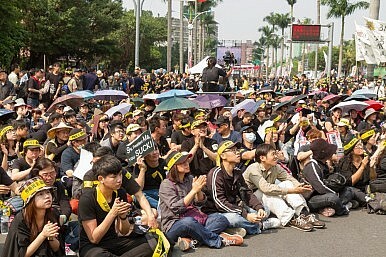 This time, with the thriving social activism of the Taiwanese youth (the Sunflower Movement) and growing anti-Chinese sentiment on the island, China’s attempts of intimidation are even more likely to backfire than they were 20 years ago. Instead of flexing its muscles and attempting to interfere with Taiwan’s democratic system, Beijing would be much better off if it decided to learn how to deal with Tsai. Especially given that the DPP candidate has proven to be a pragmatist, who is willing to accept the status quo. From 2009 to 2012, Jakub Piasecki worked for the European Parliament as a Press Officer and Policy Advisor on China. He then moved to Taipei, where he completed a Visiting Fellowship at the Taiwan Foundation for Democracy. He is currently a Visiting Fellow at the Taiwanese Ministry of Foreign Affairs, where he conducts research on Taiwan’s relations with the European Union, as well as a contributing author at the Poland-Asia Research Center (CSPA) think tank. His areas of expertise cover Taiwan and cross-strait relations. Will the Trump Administration Send a US Aircraft Carrier Through the Taiwan Strait? The Trump administration may be setting the stage for a show of reassurance toward Taipei.